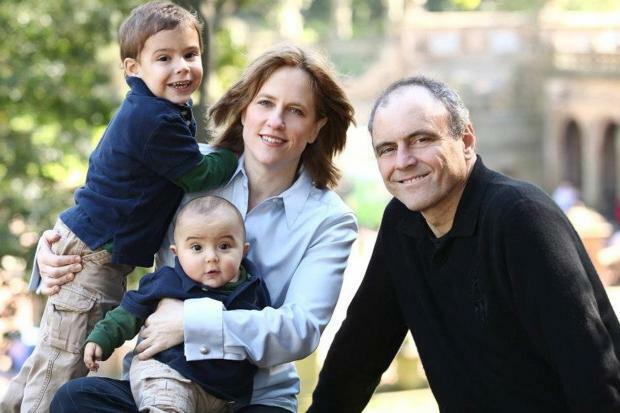 FOREST HILLS — Curtis Sliwa's ex-wife says her angel of a husband is a devilish cad who swindled her out of money to build a "nest egg" for two kids he fathered with his secret lover, Queens borough president hopeful Melinda Katz. The radio show host's third ex-wife, Mary, accused him on Thursday of lying about attending Yankees and Mets games and feigning illness in order to cover up a steamy affair with Katz while they were married. In a lawsuit filed in Manhattan Civil Supreme Court, the jilted ex claims the lying and cheating began in 2008, four years before their marriage fell apart, when Sliwa fathered Katz's first child through in vitro fertilization. The Guardian Angels founder was also a sperm donor for Katz's second child, who was born in 2011. Mary Sliwa claims that during those pregnancies, her husband said his relationship with Katz was strictly platonic. But the lawsuit says the two were much cozier, calling Curtis Sliwa "an inveterate, world-class liar" who frequently went to Katz's Forest Hills home for sexual trysts. The hook-ups happened on St. Patrick's Day in 2010 and throughout that spring, according to the lawsuit. He allegedly covered up the rendezvous by claiming he was at Mets and Yankees games and a boxing match. Twice he told his wife he was sleeping at the Empire State Building — where he broadcasts his radio show — but was really shacking up at Katz's home, according to the lawsuit. Sliwa also told Mary that his sperm donations had been frozen years earlier when Katz and he had briefly dated, and he never wanted the kids, the lawsuit says. In reality the donations were made shortly before Katz got pregnant, according to the lawsuit. The lawsuit says that after their first child together, Curtis Sliwa and Katz "conspired with each other to drain" money he shared with Mary. He also told his wife that he would have to pay significant child support to Katz, according to the lawsuit. Sliwa ended up shelling out $8,000 a month in support, even though state law limits monthly payouts to $1,700, according to the lawsuit. In total he is accused of giving Katz $405,000. "The $405,000 paid to Melinda Katz was not legitimate child support, but rather part of a plan to drain marital assets so Curtis Sliwa could leave [Mary] in due course to join his mistress," the lawsuit says. Sliwa and Mary divorced in spring 2012. He and Katz now live together in Forest Hills and are raising their children together. A spokesman for Katz, a Democrat running for Queens borough president in this fall's election, called the lawsuit sad and frivolous. "Unfortunately, it is an attempt to use a political campaign and false innuendo as leverage to publicly rehash a long ago settled divorce," spokesman George Arzt said. "Given the personal and family nature of the situation, we won't be commenting further." Sliwa did not immediately return a request for comment. Mary Sliwa is suing her ex and Katz for $1.45 million.